Option pools for employees remain relatively steady through all financing stages for private companies, from early startup to pre-IPO. 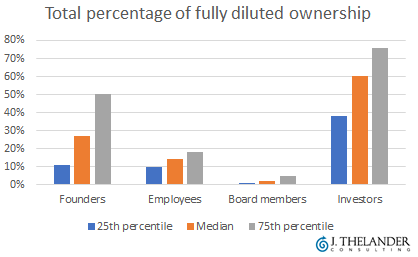 Investors and founders tend to own a significant amount of options in private companies, while the size of employee option pools typically ranges from 14% to 18%. That's according to data from J. Thelander Consulting, which provides hard-to-find compensation data for investment firms and private companies. The firm's next report will feature the results of its 2018 private company compensation survey, which covers base pay, bonuses, founder & non-founder equity and much more. For the first time, the report will also include data on new industries, including AI and robotics. Click here to take the survey; participants will receive exclusive online access to part of the Thelander platform and a discount on the full subscription.